Decades of frozen wages relative to our expanding wealth is the root cause of many economic problems. More people falling into poverty, a shrinking middle class, declining retirement savings, increased welfare spending, higher unemployment, more aid to working families, declining government tax revenues, diminished funding for Social Security and Medicare, a sluggish economy (despite a record high stock market), slow job growth and heighten social tensions along the traditional fault lines of race, ethnicity and gender are among the many issues influenced by decades of wage stagnation. Beginning in the late1970’s most American workers received only cost of living adjustments in their paychecks while their real earnings gradually diminished each year. Employers increased hourly wages to keep pace with inflation, but they suddenly stopped raising wages to reward workers for their productivity. Earned income has declined for most Americans as a percentage of our gross domestic product (GDP) This amounts to a dramatic and intentional redistribution of new wealth over the last 40 years. Nearly all this new wealth has gone to the rich and powerful. 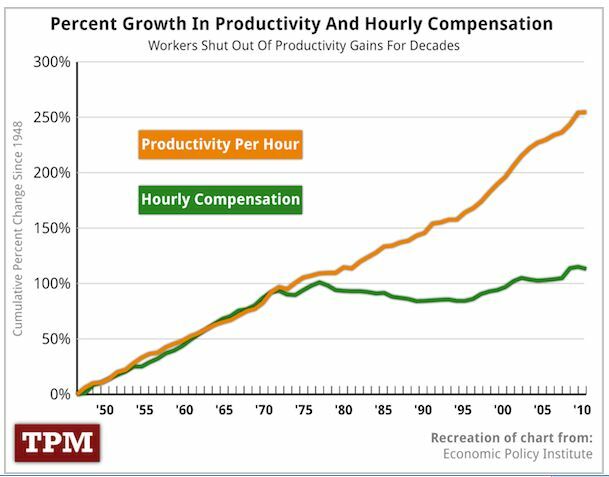 The visual evidence of wage stagnation relative to hourly GDP is apparent in one powerful graph (below). You may have this it before. The effects of wage stagnation on our economy have been gradual and cumulative. Its impacts don’t raise red flags from one year to the next, but the cumulative effects are obvious. The trending rise in income inequality, for example, was missed entirely for 25 years, and then it still took another decade for it to catch the public’s attention. Think about that for a moment, and about all the implications for wage based taxes and payroll deductions. For simplicity sake, let’s say wages would have double if the workforce received productivity raises. That would significantly reduce the number of families currently eligible for taxpayer subsidies such as SNAP (food stamps), housing assistance, daycare and the like. At the same time the workforce would be generating much more income tax revenue. Consider next the impact wage stagnation has had on payroll deductions. Social Security and Medicare premiums have not financially benefited from the growing economy. Double current wages and you double current revenues for these programs as well. Moreover, the economy has grown at an annual rate of 2.9% since 1976. If Social Security and Medicare had benefited from this new annual wealth, the effect on current revenue projections would be profound. We would not be looking at a projected shortfall any time in the future. The impact of wage stagnation on consumer spending is perhaps the most insidious problem. While worker wages have stagnated, the production of goods and services has grown. How is that possible? Some of this production is sold in foreign markets, but domestic markets are still primary. And it is here where economic theories have done a disservice. A generation of economists and business leaders have treated consumers and workers as if they were not one and the same. This has fractured how we look at the economy and given rise to the notion that labor is just another business commodity. It disguises the fact that labors wages fuel consumer spending. Wages help drive the whole economy while wage stagnation reduces consumption over time. To overcome this effect we have seen the need for mother’s to enter the workforce in mass, and for banks to invent credit cards to bolster consumer spending. These and other creative measures can no longer forestall the decline in worker spending. So while the financial markets ride the tide of America’s growing wealth, the fortunes of those who have been cut off from that new wealth continue to slip beneath the waves. As for social tensions among different racial, ethnic and gender groups, the effect of stagnant wages relative to the nation’s growing wealth creates a lifeboat mentality and zero sum thinking. For the first time in many generations parents are worried that their children will have less in life than they had. When the whole pie is shrinking a bigger slice by one person means a smaller piece for others. This thinking exists because for over 95% of wage earners the economic pie hasn’t grown in 40 years. You may not be ready to accept chronic wage stagnation as “the syndrome” underlying our economic woes, but it’s also true from my experience that having solutions (or “treatment options”) at hand often makes it easier to identifying the problems they resolve. With that in mind, I want to offer some solutions to America’s low wage conundrum. One direct approach to raising worker wages is the one currently being discussed in the public dialogue, raising the minimum wage. This benefits the lowest paid workers and also puts pressure on employers to increase pay for other lower wage earners. The current target of $10.10 per hour would still leave many families at or below the poverty line. Workers making the new minimum wage would still be eligible for some public assistance for the working poor. While passing a minimum wage law is at least possible, this option is not a systemic solution to wage stagnation. Even index the minimum wage to inflation would not compensate for declining wages relative to GDP growth. Another direct approach to ending wage stagnation is to pass a living wage law. This would set the minimum wage at a level that would allow everyone working full-time to be financial independent from government assistance, including subsidized health care. A living wage law could be indexed to the local cost of living where a person is employed. This is idea because it takes into account local economic conditions which are determined by market forces rather than government edict. But passing a living wage law in the current political climate is unlikely. There are other ways of encouraging wage growth that don’t involve direct wage regulation. One idea would require the federal government to recoup, through business income tax rebates, the cost of taxpayer supported aid to working families from profitable businesses that pay employees less than a living wage. Employee wages are easily identified through individual tax returns. Eligibility for taxpayer supported subsidies are relatively easy to estimate as well, so recouping public funding to support a company’s workforce is a practical possibility. A portion of the recovered money could be paid into Social Security and Medicare to make up for lost revenue due to substandard wages. A welfare cost recovery plan could gain popular support given the growing public resentment towards taxpayer funded social programs. At least 40% of all full-time employees in America currently require some form of taxpayer assistance to financially survive. More importantly, this plan places the burden of supporting the workforce back on profitable businesses where the responsibility lies. Do U.S. businesses have the financial capacity to offer higher wages to their workers? I would like to answer that question with another graph that you may also have seen before. There is a clock ticking somewhere in the background on this issue. There is a point somewhere in the future where it will be too late to fix wage stagnation through the normal democratic processes. History has proven this to be true. We are not at that point now, but we are past the point treating wage stagnation earnestly. New Jersey recently published the annual “Taxpayers Guide to Educational Spending”. The headline in the Star Ledger was that school spending is up 5% over last year. This is hardly news given that inflation alone accounted for 1.7% of the increase. Much of the remaining 3.3% increase in school spending is structural by design. Consider that new teacher salaries start low and increase annually as they gain experience. We also compensate teachers as they obtain higher educational degrees as a means of improving the quality of our teachers. Add to this the fact that the total number of teachers gradually increase as student enrolled numbers creep up a little every year. Then there is the higher than inflation increases in fuel costs that drive up the cost of student transportation each year. The retirement of higher paid teachers and administrators don’t quite balance out these other factors. What irks the public most about this 5% increase is really the story behind how we fund public education in New Jersey. It just seems unfair. And when you look under the hood, it really is unfair. Wealth based public school funding is regressive in nature. It favors the wealthy and disfavors the poor. What it costs to educate a child doesn’t vary that much between wealthy and poor school districts, but the value of property and therefore the tax base varies a lot. In today’s economy especially, the prosperity in wealthy school districts is growing rapidly relative to per pupil costs while property values in less prosperous school districts are in decline. The dramatic contrast between home values and per pupil costs is partially masked when just comparing tax rates because, in the suburbs, wealthier districts tend to have fewer households. Fewer household to share the tax burden mean higher tax rates to generate sufficient revenue. Despite this fact, tax rates in 8 or the 11 richest districts is among the lowest in Morris County. Only three of these wealthy districts have higher per pupil costs while three have among the lowest per pupil costs. This highlights the fact that education costs are similar across the county. The average district cost per pupil is $17,730, plus or minus $2,038. There are a few outliers in either direction. Educational costs vary far less than home values from district to district, so families in wealthier districts have a far easier time affording public education than families at the lower end of the economic ladder. While New Jersey’s State School Aid formula is supposed to help balance school funding across all districts, it does little to correct the underlying inequality and unfairness of wealth based educational funding. How should sensible people respond to divisive attacks on the poor and vulnerable? Should we begin making similar distinctions between the worthy and unworthy rich? Should we affirm those who earned their great wealth and provide social benefit but rescind all advantages given to those who use their inherited wealth to squeeze the people and their government for still more? It should be obvious that social polarity is not between Democrat and Republican, or between liberal and conservative, but rather where it has always derived, between rich and poor. Are You Forced to Subsidize Low Wage Workers? According to the NY Times: “As in 2011, 46 percent, or nearly half of New Yorkers, were making less than 150 percent of the poverty threshold, a figure that describes people who are struggling to get by. NOTE: This means that 8% of adults working FULL-TIME are at or below the poverty line, while 46% percent of all EMPLOYED New Yorkers are struggling to get by. This reinforces my analysis that NEARLY HALF of all working families must rely on some form of PUBLIC ASSISTANCE to make ends meet. Government assistance to these fully employed families = a tax subsidy on labor costs for the companies that employee them. Put another way, people who earn more are being made to subsidize the company’s low wage employees through their federal income tax withholding. Ordinary wages have been held hostage to the 1% for almost 40 years. Here below is the link to the New York Times article which is about New York City, but could be about any city in America.